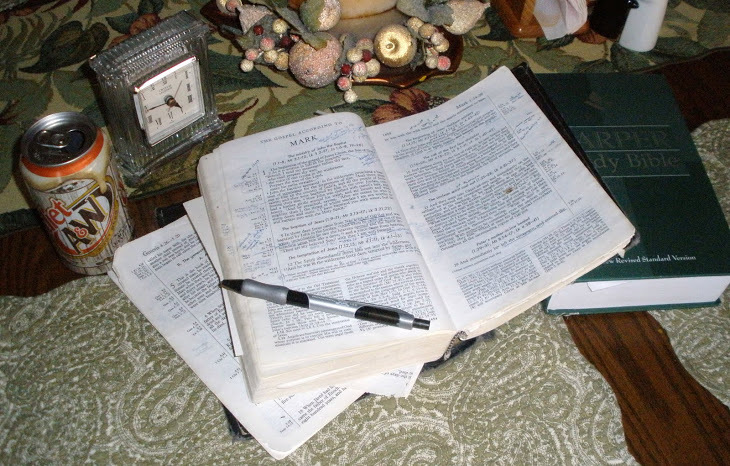 Over the years I’ve used other Bible translations; the Serendipity Bible for Small Groups (NIV) is still a favorite, and I use an Oxford NRSV for my professional writing. For a while in the 1980s I liked a loose-leaf NIV, but some of the pages became lost among other papers. My leather bound RSV with large font, a gift from my wife Beth, was excellent for public reading. Since I read aloud from it, though, I hated to mark it up. So I’ve always returned to my old Harper RSV. I’ve had it for so long, and am so accustomed to the look of the pages, that I can find scriptures quickly without necessarily recalling chapter and verse. Having a well-used Bible was, in fact, a modest personal goal. When I was in school, I wanted to lead Bible study groups someday, and I reasoned that I could have good information at hand if I wrote down facts, cross-references, and ideas in the book’s margins. I also thought about the tacit witness: a clean, new Bible might sit on the shelf as an honored “good book,” but a marked and dog-eared copy signals that the Bible is satisfying to read and explore. My book has held up well: kudos to the publishing company for making a sturdy product. The cover came off last year …and my hardback Bible became pliable! But now, pages are coming loose from the spine. Last week the first third of Genesis accidentally became mixed among a pile of mail. Knowing my partiality to this copy, Beth found an ad for a book binding service. Not long ago I found an NRSV with a similar format that I liked. Should I get my old Bible fixed? I doubted it could be. Should I change Bibles and copy notes into the new? That seemed the best option…. But instead, I opened my old Bible, placed my new NRSV and favorite reference books beside it, and began an extended time—-about three years altogether—of renewed study and pleasant reveries. This book is the result: my time of living with my old Bible as if I were living in a beloved landscape across the seasons. After all, an old Bible, carried along life’s way, is hard to part with and invites reflection. We flip through its pages, and certain passages remind us of our introduction to faith. Other passages evoke troubles survived, questions for which we sought answers, even friendships we made in Bible study groups. We read the Bible and recall ways, both subtle and decisive, that God touched our lives. We can trace aspects of our spiritual journeys among verses that we cherish. We flag portions of the Bible that raise questions, and we assemble passages that clarify God’s will. Meanwhile, vast areas of the book remain less familiar to us, depending on individual interests. But we’ve studied the book sufficiently (not to mention all the times we heard it expounded during worship, and all the times we turned to it for comfort and help), that its contents don’t intimidate. As we read, one verse reminds us of another verse, memories flow, and soon we’re making connections that open new areas of understanding. We want to share—as I have here—the interesting things we’ve glimpsed, the questions and answers, and the Holy Spirit who calls us to linger in these pages and learn and find peace. I’m sitting at my dining room table today, with my books. My old Bible is such a hodgepodge of my jottings and cross-references, many dating back to the late 1970s. I’ve a lot of information in my head, too. The other Sunday, our pastor recalled a friend who had died. At the funeral, friends and relatives read aloud the man’s favorite underlined Bible passages. To quote a Monty Python shtick, “I’m not dead yet,” but anyone reading from my Bible could get a glimpse into my interests, feelings, and questions. For instance, I’ve noted beside Genesis 1:1, to show the purpose of the universe, not to provide a geological thesis. Shortly afterward, I wrote, the first mention of time beside Genesis 1:14, the “fourth day.” At some point in college, I was considering the literal vs. the spiritual truth of the creation stories, and quickly decided I appreciated both religion and science. Moving on in Genesis, I’ve written, cubit = about 18”, 450’x75’x45’. That’s the size of Noah’s ark. I think that note was from college. Above Genesis 9, I wrote only a patient God who loves, apparently a comment by a preacher concerning God’s covenant with Noah. Later in that chapter, beside the story of Noah’s drunkenness, I’ve written clinging to an old habit? The text doesn’t indicate that point, though; hence the question mark. Other notes: the expression “valley of deep darkness” in Psalm 23:4 is echoed in Isaiah 9:2 and Amos 5:8. Next to Haggai 2:14 is my note, [The] coming blessing is ag pros, that is, agricultural prosperity. I’ve written reluctance beside Luke 9:62 (“No one who puts his hand to the plow and looks back is fit for the kingdom of God”), then I’ve written humility beside Luke 14:11 (“For everyone who exalts himself will be humbled, and he who humbles himself will be exalted.”). I’ve also written finding his will daily beside Joshua 9:14. That was a note to myself during a sermon, which in turn was during a time of spiritual struggle when I felt like I wasn’t following God’s will but, in retrospect, I was very much on the right track. Many times, we have to trust God and not our feelings or assessments. At the head of Romans 2, I’ve written Even Christians are part of the guilty mankind; men of God are still just men. But see Romans 3:21-25! I wrote that in college; in seminary I became sensitive to inclusive language. Beside Isaiah 42:14 is my note, God as mother. I’ve other jottings. Many of my notes are from my seminary years and concern the particular theological outlook, distinctive characteristics, and historical circumstance of the different books: for instance, Ezekiel rarely uses diatribe or threat compared to other prophetic books. Our choice: light or darkness is my note beside John 3:19. I’ve noted that Galatians has no thanksgiving, unlike other letters from Paul, and that Ephesians 1:3-14 is one sentence in Greek. I’ve written seems to be a separate note at the beginning of Romans 16, in response to a teacher’s comment about the many personal greetings Paul makes to a church that he hadn’t yet visited. At the end of Mark 16:8, I’ve written ephobounto gar [“for they were afraid”], implies something more? Mark’s gospel ends very abruptly, with a preposition (gar, or “for”), and as the joke goes, a preposition is something you should not end a sentence with. Perhaps we’ve lost some of Mark’s text—or, perhaps, this is exactly where the author leaves us. During a seminary class (I remember the joy of being at that school, the lecture hall’s high ecclesial ambiance, and the panic of writing notes fast enough as the teacher spoke), I wrote a sequence in the margin beside 1 Samuel 24:4-7: 4a, 6, 7a, 4b, 5, 7b. The passage is a scene where Saul has gone into a cave to relieve himself—the same cave where David and his men are hiding. The men of David said to him, “Here is the day of which the Lord said to you, ‘I will give your enemy into your hand, and you shall do to him as it seems good to you.’” Then David went and stealthily cut off a corner of Saul’s cloak. Afterwards David was stricken to the heart because he had cut off a corner of Saul’s cloak. He said to his men, “The Lord forbid that I should do this thing to my lord, the Lord’s anointed, to raise my hand against him; for he is the Lord’s anointed.” So David scolded his men severely and did not permit them to attack Saul. Then Saul got up and left the cave, and went on his way. My professor suggested that if the verses were rearranged—that’s the sequence I wrote in the margin—the passage would flow better. The men of David said to him, “Here is the day of which the Lord said to you, ‘Behold, I will give your enemy into your hand, and you shall do to him as it seems good to you.’” He said to his men, “The Lord forbid that I should do this thing to my lord, the Lord’s anointed, to raise my hand against him, for he is the Lord’s anointed.” So David scolded his men severely and did not permit them to attack Saul. Then David went and stealthily cut off a corner of Saul’s cloak. Afterward David was stricken to the heart because he had cut off a corner of Saul’s cloak. Then Saul got up and left the cave, and went on his way. is, in the original Hebrew, probably a series of nonsense syllables. The words (which I wrote in the margin) seems to be mimicking a child’s talk, the way God’s Word would figuratively sound to a sinful people. I also noted in the margin an interesting, untranslatable word play in Isaiah 5:7. I thought that was cool! He judged the cause of the poor and needy; then it was well. Is not this to know me? says the Lord (Jer. 22:16). Wow. If we love God but are uncaring toward the needy and begrudge them help, we’re fooling ourselves. We not only fail in loving God, we don’t even know God! King Josiah, though, knew God, according to Jeremiah. This verse dovetails well with Micah 6:6-8, and 1 John 4:20b, as well as Matthew 25:31-46 and James 2:14-17. So why don’t more of us step up and care for the poor, with such a plain scriptural teaching? Even the straightforward verse John 3:16 implies helpfulness to the needy, for if you believe in Christ as John 3:16 instructs, you respond to “the least of these” (Matt. 25:40). The fear of the Lord is hatred of evil. I have been crucified with Christ; and it is no longer I who live, but it is Christ who lives in me. And the life I now live in the flesh I live by faith in the Son of God, who loved me and gave himself for me. The Psalms are intermittently “yellowed”: 3, 6, 8, 23, 25, 51, 77, and 100 in their entirety. I could never memorize well enough, however, to tackle 119. I’ve also yellowed Daniel 10:12, which gave me confidence when I was a young person. He said to me, ‘Do not fear, Daniel, for from the first day that you set your mind to gain understanding and to humble yourself before your God, your words have been heard, and I have come because of your words. After seminary I stopped writing in my Bible so much and kept more in mind, so maybe I could have memorized more after all. But I didn’t want to be a person impressive in his recollection of chapter and verse. I simply wanted to learn and to teach (2 Cor. 4:5). A dear friend told me she likes my teaching style because I learn and reflect right along with students. That’s certainly been my approach to Bible instruction, too: let it be genuine and enjoyable. Let’s be more happy than pious. Let’s study in a natural, positive way. Let’s discover God’s wisdom together. When you search for me, you will find me; if you seek me with all your heart (Jer. 29:13). Harper Study Bible, introductions, annotations, topical headings, marginal references, and index prepared and edited by Harold Lindsell. Grand Rapids: Zondervan Bible Publishers, 1965. My copy is the seventh printing, 1976. I attended Greenville College in Greenville, Illinois. I’m 99.9% certain that this edition was required for the course “Biblical Theology” in the Spring 1977 semester, so I would’ve purchased this Bible (with a long-ago-discarded dust jacket) in January 1977, when I was twenty. I’m pleased to see on my college transcript that I got an A for the course. My religion professors at Greenville College in Greenville, Illinois, were positive influences at the beginning of my faith journey: Jim Reinhard, Frank Thompson, Sharon Rhonemus, and Jim Stuart. Jim Stuart taught that “Biblical Theology” course. In these thoughts, I quote from the NRSV unless otherwise noted. Brevard S. Childs, whose book Introduction to the Old Testament as Scripture (Philadelphia: Fortress Press, 1979) had just been published. His books have been important to my ongoing Bible studies, as reflected in these pieces, and my church curriculum writing. I was able to write him an appreciative letter a few years before he died, and he wrote back. 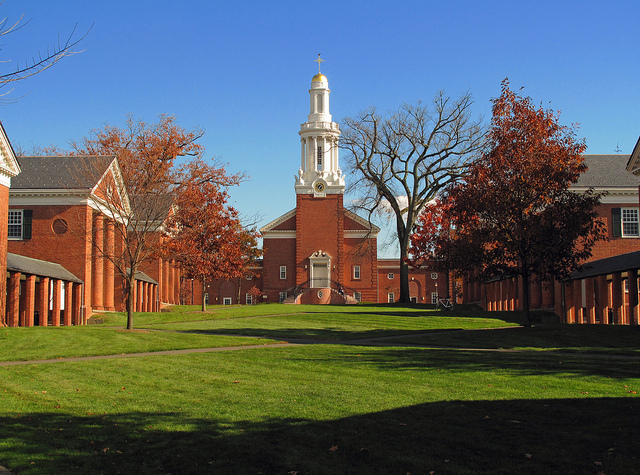 In addition to Childs, I’m also very grateful to other faculty and staff at Yale Divinity School, which I attended in 1979-1982, and to my fellow students, several with whom I’m still in touch. My YDS courses and friendships will always influence me and bless my days. Righteousness—zadaqa, or tzedakah in Hebrew, dikaiosunē in Greek—has been called “the highest value in life, that upon which all life rests when it is properly ordered,” but the term means not so much an absolute ethical norm but the quality of a relationship within society and between God and persons. Gerhard von Rad, Old Testament Theology (New York: Harper & Row, 1962), Volume 1, 370-371. Genesis Rabbah 53:14, quoted in Gunther Plaut, ed., Torah: A Modern Commentary, (New York: Union of American Hebrew Congregations, 1981), 143. My mentor Rabbi Albert Plotkin Z”L called my attention to this excellent commentary. Thomas Merton’s book Contemplative Prayer (New York: Image Books, 1990, first published in 1971) was a favorite of mine in seminary on the subject of the “dark night of the soul” and the existential emptiness that, for many mystics and monastics in history, have been opportunities for deeper surrender to God’s grace. The biblical image of “wilderness” is an apt spiritual metaphor that we associate with the Israelites’ wanderings in what we now call the Sinai Peninsula, and Jesus’ days of isolation in the bleak Dead Sea area. I discuss personal places of wilderness in my book You Gave Me a Wide Place: Holy Places of Our Lives (Nashville: Upper Room Books, 2006), 96-99.